Ireland coach Declan Kidney refused to take heart from his side's improved performance in their 38-18 loss to New Zealand in Dublin. Kidney's men led for a period in the first-half and were a far more cohesive unit than the one beaten by South Africa, but the coach insisted that they are in the game solely to win. "We judge ourselves on results so we're extremely disappointed that we lost to 20 points," he said. "We got a brilliant crowd and a dry day, the last two games have been in the rain and we had to learn how to play those conditions. "There were things that happened today that were in our own control to fix and we need to do that so that we don't lose by 20 points again. We need to hang on to the ball a bit better. We know that we're getting better but we still have a lot to do." No.8 Jamie Heaslip was also quick to concede that Ireland have much to improve upon but argued that the gulf in class between the two sides is not as big as many deem it to be. "It was frustrating at times. We made some mistakes in a 15-minute period when they showed how efficient they are," he said. "We created a lot of chances and put them under pressure. We were our own worst enemy at times. The scoreline doesn't reflect the game. If we want to win the World Cup then we have got to beat them and we do that by worrying about ourselves more than them." Meanwhile, All Blacks skipper Richie McCaw felt patience had been the key to his side's triumph, which keeps them on course for a Grand Slam tour. "We had to work hard for it," he said. "I'm proud of the way the guys played. We were playing some good rugby and I knew if we were patient and hung on to the ball we would get our opportunities. It was a good tough Test match with both teams ready to have a crack." 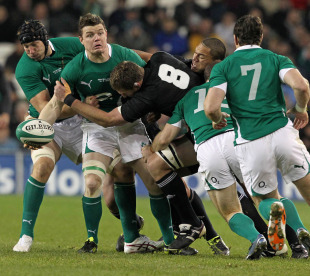 McCaw's boss, Graham Henry, was full of praise for the way in which his troops responded to the pressure exerted by the Irish during an absorbing opening half. "We have a lot of respect for Ireland. It's always a difficult game and they took us on, opening us up in a number of occasions. A year ago we thought they were real comers and we were concerned by the progress they were making. They have some very good players and can build on this performance."